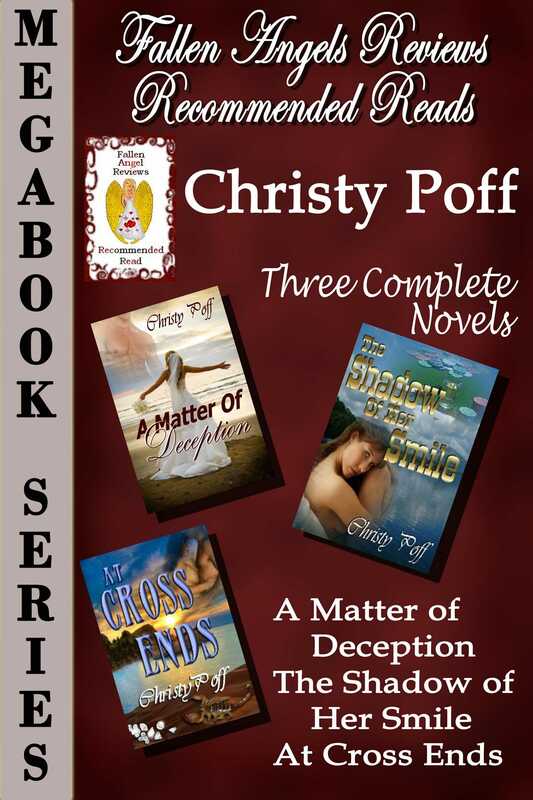 Three amazing Christy Poff novels, all awarded Fallen Angel Reviews' prestigious Recommended Read! A MATTER OF DECEPTION: Seneca Manion had everything he wanted - especially in the only woman he'd ever loved. They looked forward to their marriage, although they believed they had been married in everything but name. Being taken from his hotel room hours before his wedding told Seneca different.Adrienne Hewitt loved Seneca and no one else. She didn't want the huge wedding but her mother had insisted. She woke the morning of the wedding to learn the love of her life was gone with no explanation, and with a secret.Can a matter of deception keep their love intact or will another man's evil destroy them and those they love? THE SHADOW OF HER SMILE: Cole Dellacourt, a rich gambler to the world, works of an international law enforcement agency. The man he's been after for years, both professionally and personally, is making advances towards Ravenshire, a strategic property on the Scottish coast.Laurell Ravencroft is fighting to hold onto her birthright but the castle proves to be more valuable to Frank Sullivan and his illegal dealings. Cole helps Laurell drive him off when Sullivan is taken care of at a high-profile arms deal but it comes at a high price.Will the shadow of her smile be enough to keep them together or will the sins of the past destroy them? AT CROSS ENDS: Mark Kincaid owes Graham Cross for two years captivity in the hands of Central American terrorists and the loss of his team. He accepts a presidential assignment unaware of his enemy's involvement. Riley Devane becomes an unwilling pawn in a madman's game of revenge against first her father then his enemy. She falls in love with the man sent to rescue her but there happiness is short-lived.How long with they be at cross ends before someone finally stops an international criminal?